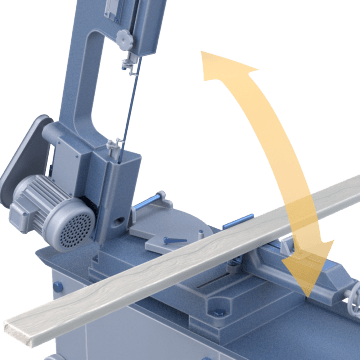 Rip wood and make straight or curved cuts when the saw is in the vertical position, then adjust the saw to it's horizontal position to make precision straight cuts using these adjustable stationary band saws. When used in the vertical position, the workpiece is pushed through the rotating blade to make straight, curved, and rip cuts. In the horizontal position, the workpiece is clamped in place while the saw blade is pushed through the piece, providing a clean, precise cut.